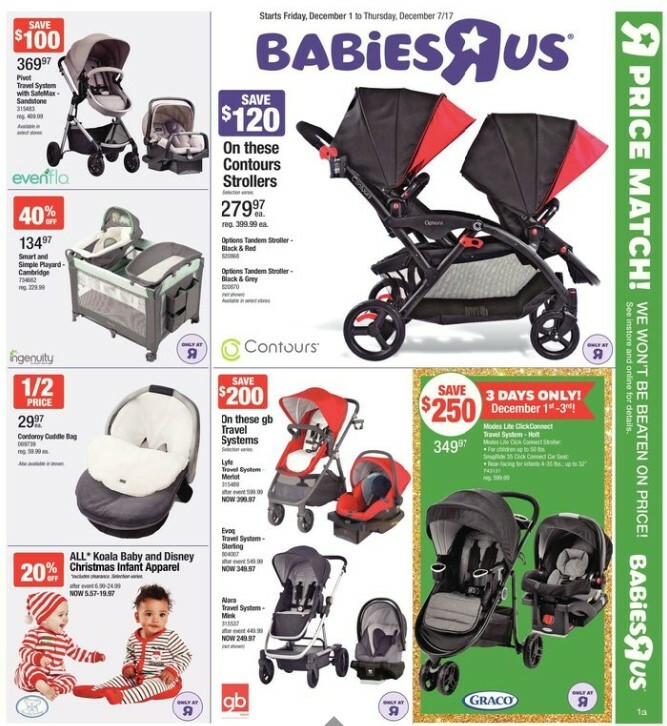 Babies R Us weekly Flyer December 1 - 7, 2017- Evenflo Pivot Travel System with SafeMax Model #: 315483 $469.99 Regular Price $369.97 Sale Price $100.00 Savings Safety, Style, and Function. You'll receive all this and more with the Pivot Modular Stroller Travel System by Evenflo. This 3-in-1 Stroller solution offers a versatile design that grows with your child. Infant mode offers both Car Seat Carrier and Carriage function. As your child grows the Pivot's usefulness evolves to accommodate both forward - and rear-facing seated positioning. Babies R Us weekly Flyer Vicks Sweet Dreams Cool Mist Humidifier - Blue Model #: 733992 $69.99 Regular Price $49.97 Sale Price 25% Savings Vicks Sweet Dreams Cool Mist Humidifier - Blue - VUL575C - Enchanting and soothing bedtime environment. Temporary relief from cough and congestion for better breathing and a more comfortable sleep. 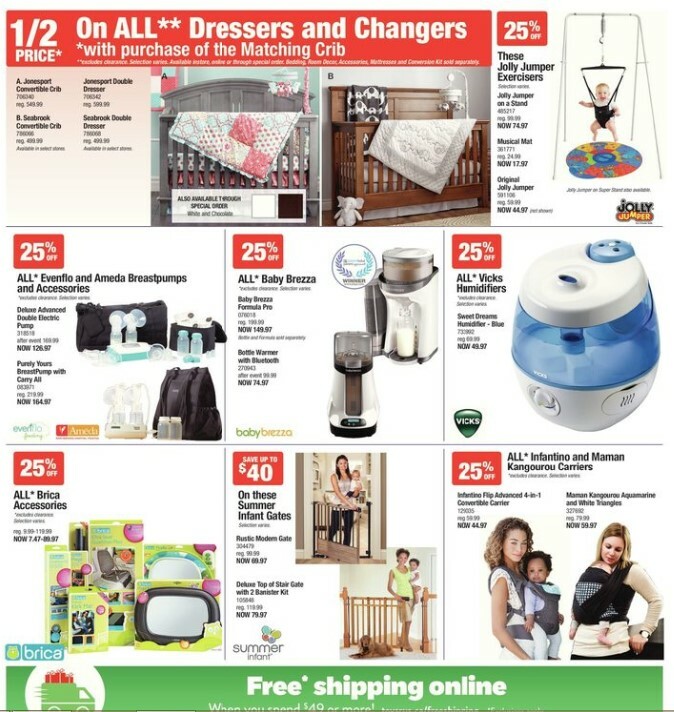 All Brica Accessories $9.99 - $119.99 Regular Price $7.47 - $89.97 Sale Price 25% Savings Excludes clearance. Selection varies Infantino Flip Advanced 4-in-1 Convertible Carrier Model #: 129035 $59.99 Regular Price $44.97 Sale Price 25% Savings Ergonomic seat for optimal hip positioning 4 Ways to carry facing-in narrow seat, facing-in wide seat, facing out, back carry. With its multiple carrying options, grow-with-baby flexibility and ergonomic seat design, this convertible wonder comfortably carries little ones from newborn through toddler years. Little Tikes 3-in-1 Sports Zone Model #: 317688 $79.99 Regular Price $49.97 Sale Price $30.00 Savings Light The Way To Active Play! 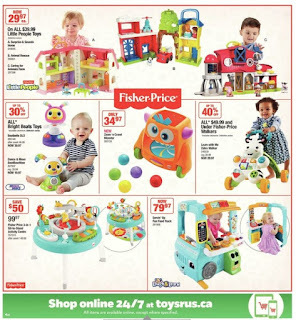 The only line of infant toys that inspires babies to walk, cruise and bust-a-move! 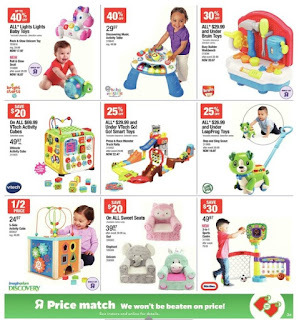 All $26.99 and Under LeapFrog Toys Up to $26.99 Regular Price 25% Savings Excludes clearance. 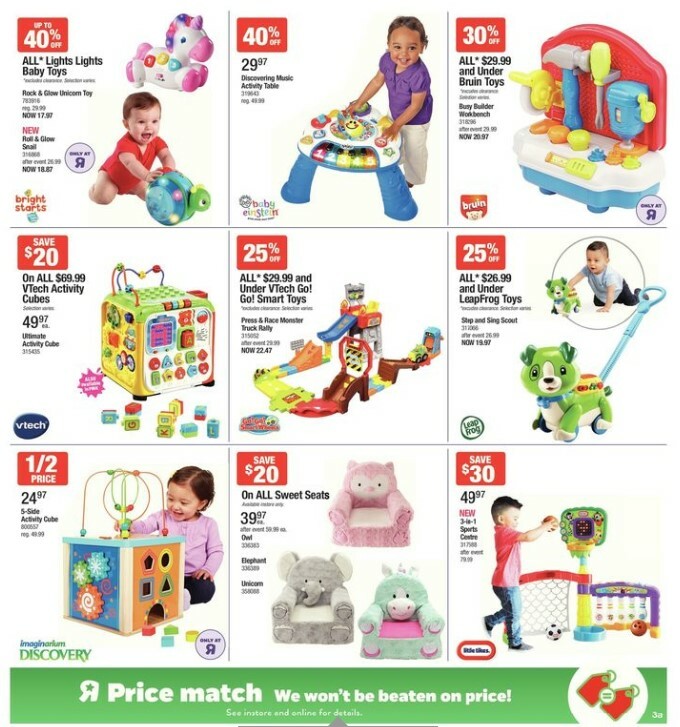 Selection varies Fisher-Price Dance & Move BeatBowWow Model #: 827937 $29.99 Regular Price $19.97 Sale Price Who likes to move? This adorable toy dog does! Get the fun started by pressing the buttons on the paws of BeatBowWow to activate fun songs, lights and dance moves. Little ones will love watching his head bob side-to-side, his ears wiggle to the beat and his soft tail light up and wag back & forth. He's so dog-gone cute, your baby can't help but dance along, all while introducing baby to colors, and counting!